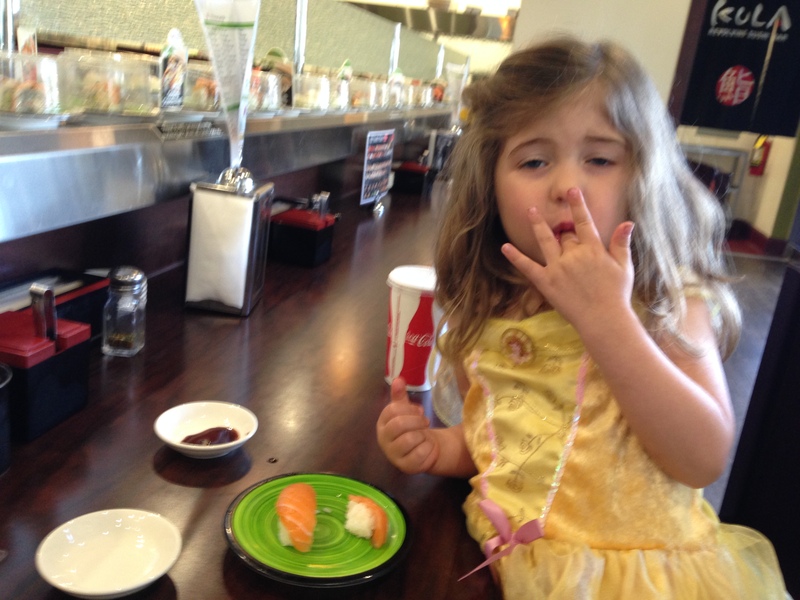 I’ve written about Imogen and her sushi fixation on several occasions before (perhaps most memorably when, in her desperation, she insisted on eating frozen salmon sushi). But recently things had reached a whole new level. At one of our Tuesday sushi dinners with the Schneiders, she lingered around the kitchen after the kids had finished their dinners. “Who is that for?” she said as I presented a platter of salmon sushi. This, after she had already eaten a full dinner and the additional six pieces of her own salmon sushi I had already served her. “That’s for the grown-ups,” I replied. But she remained vigilant, casually watching over the platter. Until there was one piece left. “You can have that piece,” I told her. It went on this way through the yellowtail, toro and albacore platters. Once during such a dinner, I had a container of salmon roe which I was placing in little dollops on top of salmon sushi. Distracted for a moment, I turned back, and there was Immy — with a spoon, eating salmon roe out of the container like it was a bowl of cereal. The other day, we were talking about her sister Willa’s upcoming birthday party. It’s a common thing at kid’s parties in Southern California to have a piñata filled with candy or toys. I stood blank faced, contemplating blindfolded kids merrily swinging a stick at a paper-maché donkey, and then screaming in horror as sticky clumps of sushi burst from within, falling into the oak leaf duff or landing on clothes and in hair. “Umm, I don’t think that will work,” I said. Her face melted into a dejected frown. That seemed like a reasonable compromise. We couldn’t easily shake the images of a sushi-filled piñata. Over the coming days, we wondered if there wasn’t perhaps some creative way to make a little girl’s dream come true. “We could fill it with those little plastic wind-up sushi toys!” her brother, Flynn, suggested. But that would only make her mad, I cautioned. “Maybe we could put in those plastic containers that have sushi in them!” sister Willa chimed in. An added level of shock as the containers hit the ground and sent California roll tumbling down the hillside. I even considered whether or not it might work with the large, seemingly indestructible plastic-wrapped onigiri and musabi rolls at the Japanese market. But I could picture her face as these nori-wrapped rice bombs hit the dirt with a dull thud. It would be a moot point anyway. I didn’t have to heart yet to tell her that on her birthday, we would be sitting in the bleachers at Fenway Park eating hot dogs. Salmon roe like cereal — that’s some good culinary upbringing! It took me a long time to eat salmon roe (while I have always enjoyed tobiko) because it reminds me too much of bait. Childhood in Alaska, I guess. Even now it’s one I have to talk myself into. But I totally laughed out loud the idea of a sushi piñata. That’s like the set-up for a brilliant viral video. You must make it happen! The organist at Fenway Park is named Josh Kantor and he takes suggestions for songs and believe me he knows every song in the world and is a great organist and plays in multiple bands like The Baseball Project, The Split Squad etc.–when not playing for the BoSox home games–as keyboardist or accordion. Follow him at @jtkantor. He tweets live and will play songs requested from the crowd. Might be a thrill to have Immy pick a song and hear it played at the park like a request line. I mean if you’re gonna be there eating hot dogs on the East coast! Hmmmm, I’m in the dark on that song and can’t say I’ve ever heard it or of it. Who does it? But he probably knows it regardless of how obscure a tune it is. I guess I’m just way not in that 4 year-old world, but I can honestly say I’ve never heard that song or maybe I have and just didn’t know it as anything different. Anyway I’m going to try and find it online and give it a listen . . . see what I’m missing. I got Lori and her friend Suzanne two tickets to see Wilco tonight at the Hard Rock Universal and then we are off to St Augustine Friday for the weekend to see Wilco play at Gamble Rogers amphitheater where cool ocean breezes blow. Then Jamaica is coming down for the week with Riley and it’s off to Disney’s Animal Kingdom to practice our “What does the (fill in the animal) say/sound like? Going to be a very fun week of touristy stuff, swimming and cooking and dining with my baby and grandbaby ahead! Baba is a happy boy! You finally got your food lover!! It’s sort of spread over all three kids. Flynn loves baguettes and stinky cheese, Immy is my sushi lover, Willa is crazy for spicy food and tomatoes and bufala mozzarella. She’s not uncertain of her desires, dislikes and likes! Ha! Made me laugh. Theydo say the funniest things sometimes. Has she tried Kim-bap, AKA Korean “sushi”? Actually, it’s not sushi at all, but rolls made similar to California rolls with all kinds of different non-fish fillings. She’s very specific in her sushi passions. She doesn’t want anything that is sushi-like but not sushi. That’s a girl after my own heart.